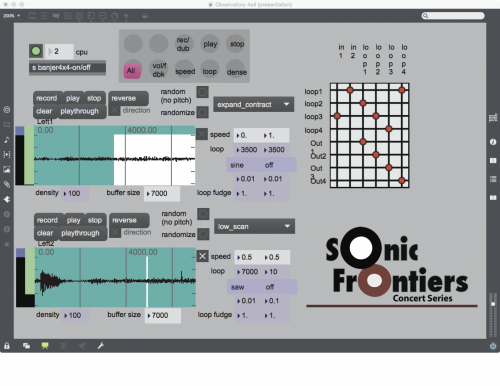 The Sonic Frontiers Workshop Series at The Grocery concludes this week. 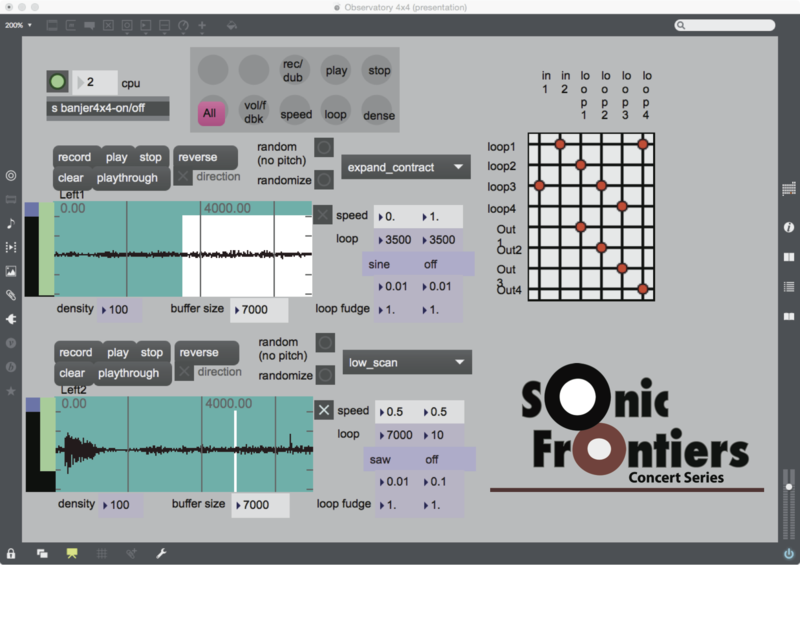 I will present an introduction to interactive electronic music including a live performance or two. Then workshop attendees will create a one-night-only audio installation in The Grocery gallery using the Cycling ’74 Max modular programming environment. The Grocery will be closing its doors at the end of the month, so this is one of the last chances to come experience an important hub for cultural life in the Tuscaloosa area. Bring an instrument/noisemaker, or just come to listen. No previous experience is necessary. The Grocery gets hot in the summer, so dress appropriately. My installation With Hidden Noises is being presented as part of the Wired Kingdom exhibit at the Arts Center of the Capital Region. 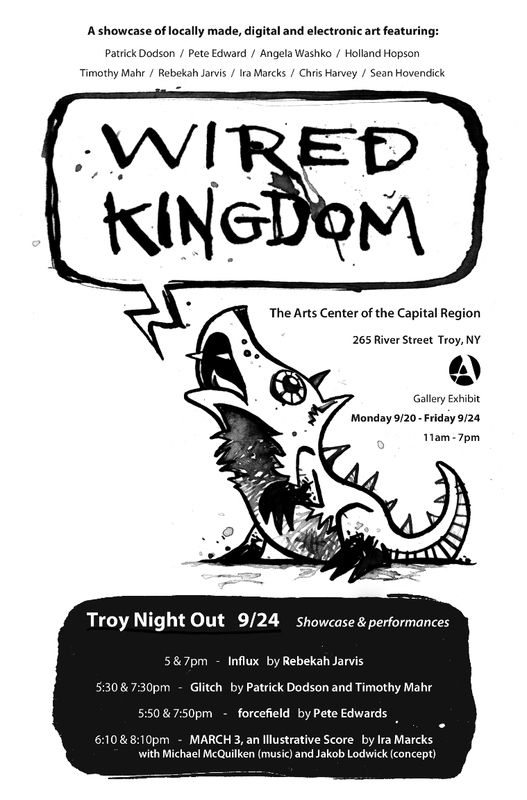 The exhibit will have a short, sweet run beginning Monday 9/20 and culminating with performances on Friday 9/24 as part of Troy Night Out. With Hidden Noises is an interactive sound installation based on Marcel Duchamp’s sculpture of the same name. The original sculpture contains an unkown object placed inside by Duchamp’s patron and collector Walter Arensberg. The sculpture rattles when shaken, making it an early example of audio art. Unfortunately, the original is usually displayed in a vitrine and patrons aren’t allowed to activate it. Visitors to my installation can handle a replica of Duchamp’s readymade containing electronic sensors instead of an unkown object. Their interactions with the scultpture cause it to produce a variety of sounds related to Duchamp’s work. See some photos here and check out the CD based on the installation. Wired Kingdom features work by Patrick Dodson, Pete Edwards, Angela Washko, Timothy Mahr, Rebekah Jarvis, Ira Marcks, Chris Harvey and Sean Hovendick.